I’m obsessed with getting a high quality product for a reasonable price. For that reason, I have spent the last year testing out a wide variety of yoga accessories produced by a number of different yoga equipment brands. If you’re looking for some yoga gear for your home practice, look no further! I consider yoga straps and blocks to be essential items for your home practice. Straps help you move into a variety of poses, including forward folds, twists and binds. Blocks help you with both seated and standing poses, helping those with tight hips to sit comfortably (chip foam block) and those who want to push themselves with more challenging standing poses (bamboo, cork or foam blocks). This is my full review of some of the best blocks and straps out there. In this video David, DoYogaWithMe's founder, shows you the characteristics of the blocks and straps in this review. Note: All prices are in US$. This, as far as I’m concerned, is an essential inclusion when selecting props for your home practice. It’s the best block to sit on or provide padding for your knees when in a lunge and is incredibly multi-functional, particularly if you have more than one. There aren’t many reasons not to buy this block. The foam chips away quite easily, but these blocks generally last a long time. You feel more comfortable when you’re sitting on something. You like padding under your knees. You need something firm and solid to lift you higher in any pose. You are happy using a blanket or other block to sit on. You are happy using a blanket under your knees. You don’t see any other use for it. Click here to order the Halfmoon Chip Foam Yoga Block from their website. This is the same as the halfmoon chip foam yoga block but it comes with a snug-fitting cover, preventing foam from chipping off and extending the life of the block. As stated above, there aren’t many reasons not to buy this block… this one just costs more. You want to prevent the foam from chipping and extend the block’s life. You want a chip foam block but prefer to pay less. Click here to order the Halfmoon Chip Foam Yoga Block with Cover from their website. The Hugger Mugger Bamboo yoga block is solid, durable and light, and is also bigger than the average block. It’s made from one of the fastest-growing natural materials, making it a great choice for the eco-conscious. They are also a lighter than their wooden counterparts due to the density of bamboo and the block’s hollow core. The blocks have rounded edges and a nice finish. The weight of the bamboo block can be a deterrent - it’s about halfway between a foam block and a wooden block. It also has a harder, more slippery surface than cork or foam. You like a block to have some weight. You like the feel of bamboo. You like a block that feels solid. You like blocks that are a bit bigger than average. You prefer a block that is easy to grip. You like blocks that are light and have some give. 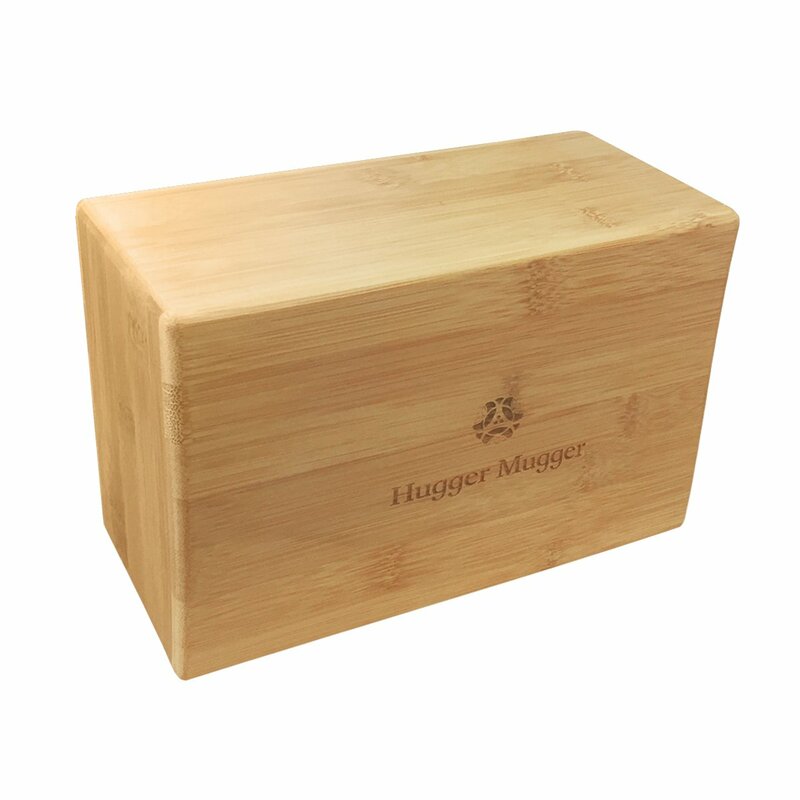 Click here to order the Hugger Mugger Bamboo Block from Amazon. Halfway between the bamboo block and the foam block is the cork yoga block, in terms of weight, firmness, hardness and ease of use. It has more grip than both blocks, is easier to sit on than bamboo, provides more stability than foam and might simply feel nicer to some yogis (cork feels good!). It’s also eco-friendly and biodegradable. This cork yoga block is the same size as the bamboo and recycled foam blocks made by Hugger Mugger, but it’s made from cork. Lastly, you receive a 10% discount when you purchase from this page. Cork can be too dense to sit on and too heavy to move around or hold in the air for some people. This block is particularly big and therefore heavy, for a cork block. You like a block that has a surface that is easy to grip. You like the feel of cork over bamboo or foam. You like a block that is firm and solid, but has give. You like the fact that cork is eco-friendly. You like a big, thick block, giving you more support in all poses. You prefer a block that is light, such as foam. You prefer a harder, smoother block, like bamboo. You prefer a softer block, that is more comfortable to sit on. You prefer a thinner, lighter block. Click here to order the Tranquil Yogi 4” Cork Yoga Block from their website. If you are looking for a block that is light, extremely firm and eco-friendly, the Hugger Mugger Recycled Foam Block is one of your best choices. They are strong and solid, with beveled edges and are long lasting and recyclable. The density of this block can make it too firm for some yogis, especially those who would like to sit on it. You like a block that is really light. You like the feel of foam over bamboo or cork. You like a foam block that is more dense than most. You prefer a block that is heavier than foam. 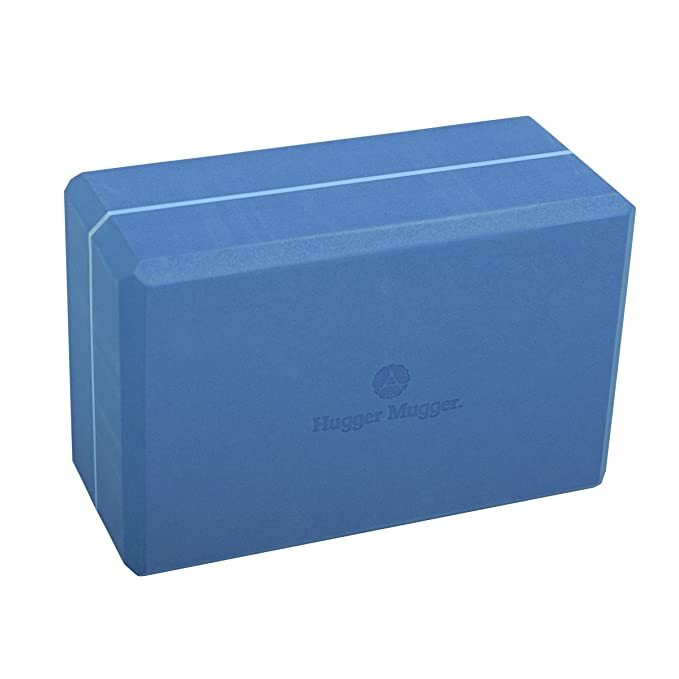 Click here to order the Hugger Mugger Recycled Foam Yoga Block from Amazon. This is a slightly smaller (thinner and shorter) cork block than the Tranquil Yogi 4” block, making it lighter and easier to handle. Of course, it has all of the benefits of a cork block (firm but soft, grippy surface, easy to use, eco-friendly) so the choice can be mainly about size and price. Cork can be too dense to sit on and too heavy to move around or hold in the air for some people. Click here to order the Halfmoon Cork Yoga Block from their website. The Hugger Mugger Core Block has all the features of the Halfmoon, above, but is slightly lighter at 1.9 lb. As stated above, all of the benefits of a cork block apply, which are many, so you can make your choice based on size and price. This cork block is the mid range in terms of size, but it can be still too dense to sit on and too heavy to move around or hold in the air for some people. You like cork but want a block smaller than the ones above. 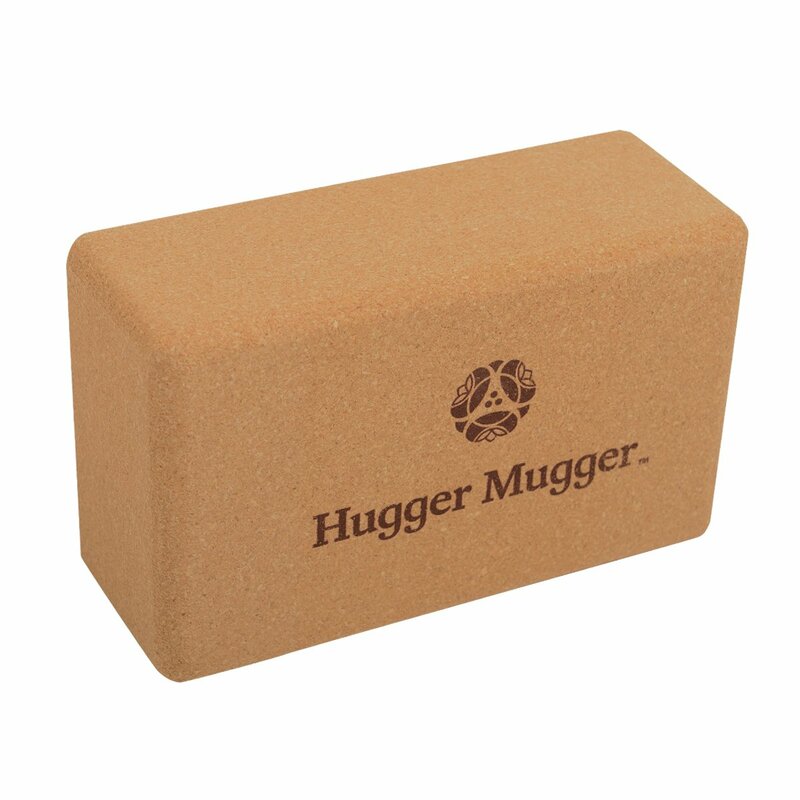 Click here to order the Hugger Mugger Cork Yoga Block from Amazon. This cork yoga block has all of the great features of cork (firm but soft, solid and supportive, easy to grip, eco-friendly and biodegradable) but is thinner than the others. Half an inch doesn’t seem like a lot but it is when you’re moving the block around or holding onto it, particularly if you have smaller hands. It’s also a bit lighter, which also makes a difference during a class. Lastly, Tranquil Yogi gives you 10% off when ordering from this page. Along with cork being too dense to sit on and too heavy to move around for some people, you may simply prefer a thicker block. You like a thinner block, making it easier to grab and hold. You prefer a thick block. This is a slightly thinner, lighter version of the cork yoga block that has all of the great features of cork (firm, soft, solid and supportive, easy to grip, eco-friendly and biodegradable) but is thinner than the others. Along with cork being too dense to sit on and too heavy to move around for some people, you may want a thicker block. This is the standard foam yoga block, the one you will find in most yoga studios. It’s big, thick, firm with some give, is extremely lightweight and provides the stability you need. It’s all around a functional, sufficient block. Note: halfmoon also has a 3” version of this block available for around $9.00. If you are interested in the 3" Halfmoon Foam Block, click here. This is not the best choice for the eco-conscious. EVA appears to be a safe for use but it is not easily biodegradable or recyclable. This yoga strap is strong, the perfect size for the average yoga student and, best of all, is made from organic cotton. The material has a fairly coarse feel, allowing for easy grip, and is quite flexible and easy to manipulate and the metal buckle is strong and holds very well. This is also the only strap that I know of that has a looped end, allowing you to loop it over your foot, arm or shoulder without having to use the clasp. The loop on the end of the strap makes it a bit harder to slip the end through the metal buckle. The slight coarse feel of the cotton may also be a deterrent for some, even though it allows for better grip. You like a strap that has grip to it. You like that is has a strong, metal buckle that holds firm. You like that it’s made from organic cotton. You think you may find the loop at the end of the strap useful. You prefer a strap that feels smooth. You prefer a strap that is easy to slip into the clasp. You prefer a plastic buckle. You don’t think you would use the loop on the end. Click here to order the Halfmoon 6’ Organic Cotton Loop Strap from their website. The Hugger Mugger D-Ring 6’ Yoga Strap is the thinnest of the bunch, making it very pliable and wraps around the feet and hands a lot easier. The material is halfway between being coarse and smooth, allowing for decent grip and it has a large d-ring buckle that holds surprisingly well and makes it very easy to thread the strap through. I imagine this strap would not last as long as its thicker competitors. The most important issue is that it is made with non-organic cotton, a crop that requires a lot of pesticides and water. You like a strap that feels halfway between smooth and rough. You like that is has a strong, metal clasp that holds firm. You like that it has a large d-ring, making it easy to thread the strap through. You like a strap that is a thin and pliable. You prefer a strap that feels very coarse or smooth..
You prefer a plastic clasp. You prefer a strap that is stiff and feels strong. You prefer to choose a more environmentally sustainable option. Click here to order the Hugger Mugger Cotton D-Ring 6’ Yoga Strap from their website. This is the longer version of Halfmoon’s 6’ loop strap. It has all of the great features, including a material that is strong and easy to grip, and buckle that holds strong, a loop at the end of the strap that can go over your foot or hand and, best of all, it’s made from organic cotton. The reasons you may be happier with another strap are the same as the 6’ loop strap: the loop makes it a bit harder to get the end through the buckle and the slight coarse feel of the cotton may not be what you are looking for. You want a yoga strap that is longer than 6’. You don’t need an extra long strap. Click here to order the Halfmoon 8’ Organic Cotton Loop Strap from their website. The Raja Yoga Strap is a bit thicker than other straps, making it feel a bit stiffer and incredibly strong and durable. The strap is smooth and feels nice to the touch. The D-ring buckle holds firm and the strap is made from 100% organic cotton. The extra thickness and the smooth surface can make it more difficult to some people to hold onto the strap. The D-ring, although it holds very firm, makes it harder to thread the strap through. You like a strap that feels smooth. You like a strap that is a bit thicker and stiffer. You prefer a strap that feels coarse and has good grip. You prefer a strap that is not at all stiff - that feels pliable. 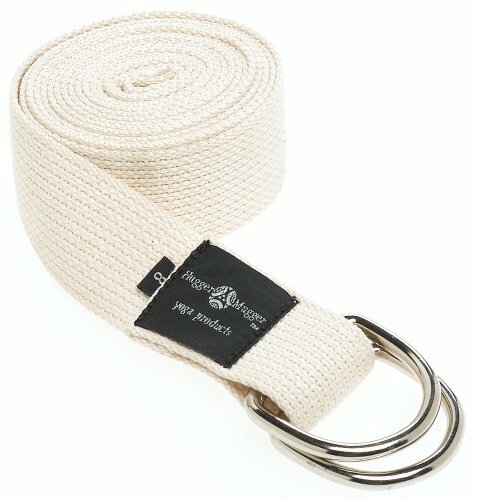 Click here to order the Prana Raja Organic Cotton Yoga Strap from the Prana website. The Hugger Mugger D-Ring 8’ Yoga Strap has all of the same qualities of the 6’ strap shown above, but it’s 2 feet longer. To summarize, it’s thin and pliable, halfway between coarse and smooth and has a large d-ring buckle that holds surprisingly well and makes it very easy to thread the strap through. This strap may not last as long as its thicker competitors and it is made with non-organic cotton, a crop that requires a lot of pesticides and water. You are looking for a longer strap than average. You would likely be happy with a 6’ strap. 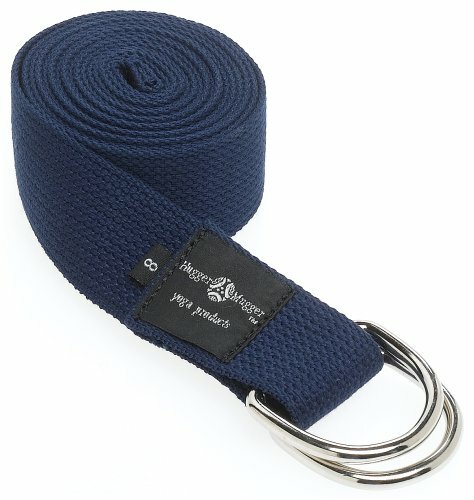 Click here to order the Hugger Mugger Cotton D-Ring 8’ Yoga Strap from their website. Halfmoon’s joy-a-toes are a fantastic way to relax and rejuvenate your tired, achy, tight feet. They essentially spread your toes out, increasing flexibility between the toes, improving circulation, opening channels of energy, relaxing soft tissue, realigning bones and helping your feet recover from the punishment of everyday life, including wearing high heels. They also help you avoid, or lessen the impact, of bunions. I don’t see any reason not to purchase a set of joy-a-toes, outside of price. They are quite expensive, but so worth it! You would like to stretch your toes out. You would like to help your toes recover from being in tight shoes or high heels. You are getting bunions or want to avoid them. You like when your feet feel refreshed and rejuvenated. You don’t need self love for your feet. You can’t afford a pair. Click here to order the Halfmoon Joy-a-Toes from their website.